The new Horipad FPS Plus delivers PS4 control with an Xbox feel. Japanese peripheral maker, Hori, is set to release a new version of its Horipad FPS controller in July. 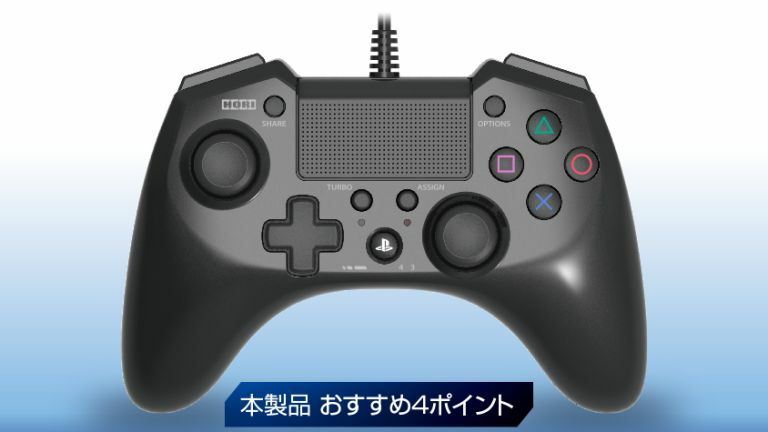 The new version, the Horipad FPS Plus, uses the same analogue stick and button layout as the Xbox controller, but also now comes with the standard PS4 controller's central touch pad. Since the first games console first dropped there has been a pitched battle about not only which machine is best but also which controller you prefer. In fact given there are so few platform exclusives, so many cross platform games and relatively little between the latest consoles in terms of hardware, the controller could once have been one of the defining factors about whether to go for PlayStation or Xbox. The asymmetrical layout of the Xbox controller has become the standard for a lot of third-party peripherals, but now you can get the same setup for your PlayStation. The previous Horipad FPS used the same Xbox-aping layout, but without that touchpad you were missing out on some key PS4 functionality. Unfortunately with Hori's new pad we are talking about a wired controller here and also one that doesn't include either the audio jack or any motion control characteristics either. So, the traditional PS4 controller probably doesn't have too much to worry about. It could though help the hordes of old Xbox gamers who are transitioning over to the PS4 with this latest console generation. Despite the regularly dropping prices of the Xbox One it's still losing market share to Sony's dominant console. Data and analysis company, IHS, is estimating the gap to widen over the next few years too, especially in Europe. It is predicting the disparity between PS4 and Xbox One to hit some 22 million devices by 2019.